Can anxiety cause stomach pains? It certainly can. When the energy is knotted in your solar plexus chakra, it is very easy for this to manifest as pain. Here’s what you can do to soothe the stomach pain. I’m often asked whether anxiety can cause stomach pains and I say: YES!! Anxiety causes muscle tension and muscle tension can be felt anywhere. A lot of people ask can anxiety cause stomach pains when they hold tension in their tummy muscles and this is not only your abdominal muscles but also the muscles within your digestive system. Your stomach can hold tension which can cause spasms within your digestive system which can cause those muscle pain and muscle tension and stomach pain symptoms that you’re experiencing. So yes, I say definitely yes: physically, anxiety can cause stomach and abdominal pain symptoms. I’ll get into the energetic reason, why it is and will just show you some ways that you can help move the energetic block that’s causing the stomach pain symptoms that you’re getting. The stomach is where your solar plexus chakra is in your chakra system. The solar plexus chakra is the third chakra from the bottom. So, you’ve got your base chakra, your sacral chakra and then your solar plexus chakra which is located right around or just above your belly button and this is place where your confidence is. A nice healthy solar plexus chakra will be glowing a lovely, happy, yellow-gold color. However, if anxiety is impacting your solar plexus chakra, you’ll notice that your self-esteem and your confidence levels are definitely impacted. You might feel like your shoulder’s hunched over a little bit and that causes your tummy to tense up as well which can cause these stomach pains that you’re experiencing. Sometimes, it can just feel like these stomach pains come out of nowhere but it’s definitely caused by this knotted up energy that’s coming into your solar plexus chakra and causing everything to kind of seize and block up. So, I want you to bring acceptance. Instead of trying to push away that anxious feeling, I want you to just relax, completely relax and almost lean into the pain that you’re getting and allow your solar plexus chakra to just un-knot itself and relax itself. You might find that as you do that, you sort of feel like you might want to burp a bit, you might feel that things start to move around a little bit, you might get some tummy rumbles or some tummy gurgles. That’s completely normal as well as you just bring the energy of acceptance into your solar plexus chakra where it’s stored right there. Secondly, I’d like you to breathe white light down into your solar plexus chakra. Just imagine white light as you breathe in, coming into your nose, bring that white light down into your throat, down into your belly and then you feel your solar plexus chakra really open up as you’re bringing white light down. So, if you imagine your solar plexus chakra located just above your belly button expanding as you breathe the white light in and then going back down again as you breathe the white light out again. White light is pure healing energy. You are imagining it but it’s also taking place energetically in your body as you’re doing this. You’re breathing the white light in down into your belly allowing the white light to relax and un-knot everything and then you’re exhaling the white light energy. 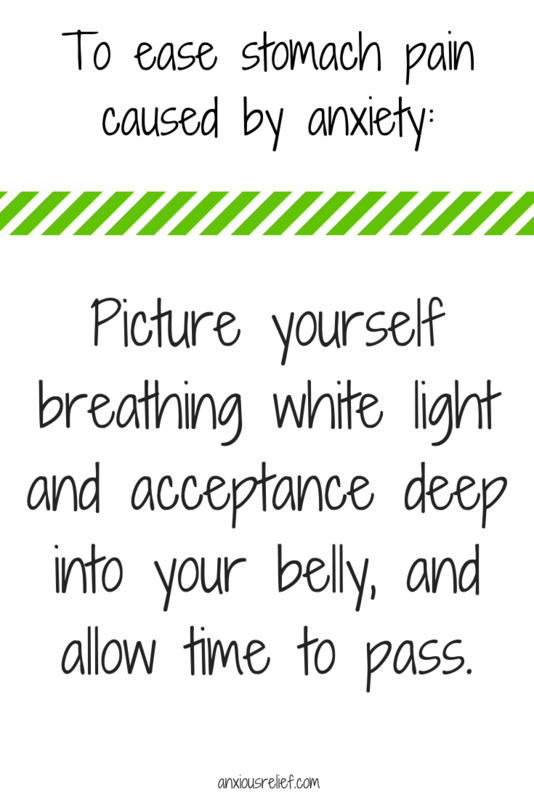 This is really useful for just allowing the muscles in your body to relax and getting the white light into your stomach where it’s really needed and allowing the energy to do its job. The third thing that you need to do is to let time pass. When you want to know can anxiety cause stomach pains, you want your cure to be instant. I get it. Getting rid of stomach pains caused by anxiety doesn’t happen immediately, unfortunately. By consciously relaxing the muscles in your abdominal section and by breathing white light in, you’re a good two-thirds of the way to getting rid of these stomach pains. However, you really just need to keep doing those two things and allow time to pass. Time’s a fantastic healer and I don’t mean too long of a period of time. I don’t mean days and days and days. I mean an hour or two just to relax and let the white light settle in and do their job. A lot of the work of energy healing is done subconsciously. This is particularly true when you are searching for the answer to can anxiety cause stomach pains. So you’ll do the white light exercise and then go about your normal routine trying to keep as relaxed as possible in your tummy area and time will allow the energy to do the rest of its work, remove these blockages away, will bring things up to the surface. I have a white light protection meditation which is all about bringing wonderful, safe healing energy all around you to insulate you and to keep you in a bubble of happiness and peacefulness and contentment. This will protect you as you go forward and allow time to do its job in healing your tummy pains that are caused by anxiety. Can anxiety cause stomach pains? Not if you follow the steps above to really allow yourself the time and the space that’s needed to relax and bring white light in and to allow the pain to really melt away.